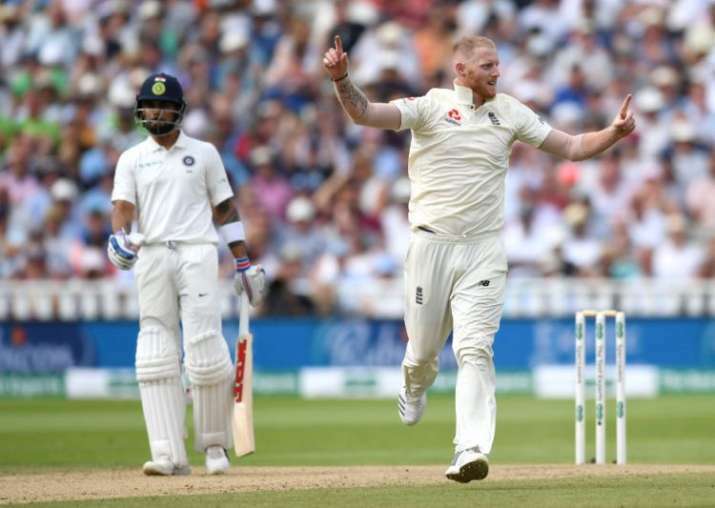 India vs England, Live Cricket Score, 1st Test: Catch all the Live updates from Day 4 of the first Test between India and England from Edgbaston Cricket Ground with IndiaTV Sports. 17.01 IST: England (287 & 180) beat India (274 & 162) by 31 runs in Birmingham to take 1-0 lead in five-match series. Stokes 4/40, Kohli 51. Hardik Pandya OUT! Stokes hunts down Pandya! ENGLAND WIN BY 31 RUNS! It's a back of a length delivery in the channel outside off, holding its line, Pandya could have left it alone but has a needless poke inside the line. Gets a thick outside edge behind to Cook at first slip who makes no mistake. Joe Root runs in joy, the English team is ecstatic as they take a 1-0 lead in the series. 16.58 IST: Adil Rashid to Umesh Yadav, no run. Nopes. Bowls a flatter leg spinner on off, Yadav defends it off his back foot. This is not over yet. IND 162/9 in 54 overs. 16.49 IST: Buttler comes in at silly point. 16.47 IST: FOUR! Finds the fence with a crunching shot! He gets four runs but that means Umesh Yadav will be on strike for the next over. Fuller around off, Pandya lofts it cleanly over extra cover for a boundary. 36 to win now. IND 158/9 in 59 overs. 16.43 IST: Umesh Yadav is the last batsman for India. 16.42 IST: OUT! Adil Rashid removes Ishant for 11. It's plumb and the number 9 goes down for India. Adil Rashid has done the job for England. A well-disguised googly by the leggie, not read by Ishant, who gets forward to defend. Misses the ball completely and is rapped on the pads. They appeal but the umpire remains unmoved. India 274 & 154/9, need 40 runs vs England (287, 180). 16.41 IST: Ishant Sharma is not given out lbw! England have taken the DRS. Looks plumb. 16.36 IST: Massive moment! Adil Rashid to bowl. Hardik Pandya will be desperate to get on strike. 16.34 IST: Drinks break. The players need it. It has been an electrifying first hour. India are under the pump after losing three wickets although the current pair has given them a slight hope. 42 more needed. 16.32 IST: FOUR! Another boundary down to third man. Surely, Root will be thinking now to put a fielder there. Ishant though was in no control this time. Stokes bangs it in short, takes Sharma by surprise with the extra lift. The tall batsman fends at it and it flies off the splice of the bat. Goes over gully and speeds away to the fence. 16.31 IST: Point moves a little backward. No third man in place still. 16.30 IST: FOUR! Well played, Ishant! A length ball outside off, Sharma stays back to play at it with angled bat. Gets it away from the sweet spot of the bat as it races down past gully for a boundary. Under 50 needed now for India! 16.26 IST: Sam Curran to Ishant Sharma, no run. Appeal for a catch! Is it a bump ball? The umpires get together before going upstairs. A low full toss outside off, Ishant pushes at it and gets it away off the outside edge. The gully fielder catches it and they appeal. It's referred upstairs and the replays detect a bump ball. 16.24 IST: Ishant Sharma is in next. Sam Curran is also into the attack. 16.23 IST: OUT! Stokes removes Shami for 0. Stokes with the double strike and this leaves India reeling in some serious trouble. Edgbaston roars in unison along with Ben Stokes. Back of a length, Big Ben hits the deck hard and angles it in on off, Shami hangs his bat to defend and the edge is drawn. It goes behind and Jonny Bairstow completes the formalities. 53 runs runs still to win, only two wickets in hand. Hardik Pandya is the last remaining hope for India. It's all going down in Birmingham. India 274 & 141/8, need 53 runs vs England (287, 180). 16.20 IST: Mohammed Shami is the new batsman. 50 more needed. 16.19 IST: OUT! Stokes removes Kohli for 51. Stokes has struck gold! Massive, massive moment in the game. Kohli trudges off the ground. He is getting a standing ovation though. Knowing him, he will be deeply disappointed. It was a good delivery to be honest. Stokes surprises the Indian skipper with an inswinger. It jags back in from around off, Kohli plants his front foot forward and across as he attempts to flick it. Misses the ball completely to get rapped on the pads and they let out a huge cry for an lbw. Umpire Aleem Dar has no hesitation in raising his finger. Root sets off in celebration. Stokes is pumped up. Barmy Army has gone bonkers. Kohli somewhere knows he is gone. Still tries his luck and takes the DRS. The replays roll in. It's not a no ball, has hit Kohli in line and is taking the leg stump. Is this the game? India 274 & 141/7, need 53 runs vs England (287, 180). 16.16 IST: Ben Stokes is the first bowling change of the morning. 53 more needed. 16.12 IST: FOUR! Another boundary for India! The target is reducing every minute and England will start to feel the heat. An inswinger by Broad around off, Pandya gets forward and across before clipping it with beautiful timing through mid-wicket for a boundary. IND 141/6 in 45.3 overs. 16.10 IST: FOUR! Sublime! Broad once again overpitches outside off, Pandya takes a little stride forward, doesn't look to hit it hard and just caresses it through the line. It goes past the bowler and the left side of the mid off fielder for a boundary. 16.08 IST: FIFTY! Virat Kohli hits his 17th Test half-century off 88 balls. FOUR! 17th fifty for Virat Kohli. India's hope is going strong. Anderson once again is too straight in his line to the Indian skipper. Kohli moves across and tickles it fine down the leg side for a boundary. Not any celebration, he is focused, knows that the job is not done yet. India 274 & 133/6, need 61 runs vs England (287, 180). 16.03 IST: FOUR! What a straight drive. Shot! Huge cheer from the Indian contingent in the crowd. Broad goes searching for the magical ball but ends up serving a juicy half-volley around off. Pandya brings down a straight bat and drives it crisply down the ground for a glorious boundary. Confidence-booster! IND 125/6 in 43.4 overs. 16.02 IST: Meanwhile, Indian fans strongly feel it's now Virat Kohli vs England. 15.56 IST: Stuart Broad to Virat Kohli, no run. Defended off the front foot by the batsman presenting the full face of the bat. IND 120/6 in 42 overs. 15.44 IST: James Anderson to Hardik Pandya, 1 run. A little short and around middle, once again Pandya works it across the line towards square leg and crosses. 15.36 IST: Hardik Pandya is in next. 82 more needed. Stuart Broad to bowl from the other end. 15.35 IST: OUT! Anderson removes Karthik for 20. Everything is fine in the replays and DK continues with his long walk to the pavilion. Fantastic bowling by Anderson. Backs up the last inswinger with a delivery shaping away. Lands it close to the off stump line and keeps it on the shorter side. Karthik stays back to play the line but doesn't account for the away movement. It takes the outside edge and flies behind towards second slip. Dawid Malan there makes no mistake this time as he grabs a low catch in front. The umpire checks for the front foot no ball but it's fine and the catch is also clean. Early blow for India, Kohli is not looking amused. India 274 & 112/6, need 82 runs vs England (287, 180). 15.33 IST: Caught behind! Huge celebration from England. Karthik has started to walk. Is near the rope but is stopped as the umpire wants to check for the front foot no ball and the cleanliness of the catch. 15.30 IST: 'We will go to bed dreaming about getting Kohli out first thing' said James Anderson in the press conference last evening. Let's see if that dream comes true. Here he is, running in to bowl with Dinesh Karthik on strike. Three slips in place. 15.20 IST: Birmingham all set to host the fourth day of the first Test. 15.05 IST: Whatever the result today, one thing is for sure - there will be glory for one team and heartbreak for the other. While India hold a slight upper hand with the talismanic Kohli still there, England will be thinking of getting him out as early as possible to expose the lower order. 14.55 IST: Meanwhile, the hero of India's bowling effort yesterday, Ishant Sharma credited his county stint for his match-defining five-for. 14.45 IST: The fact that India are so close to winning this Test has a lot to do with another Delhi cricketer apart from Kohli. Click here to find out what Sachin Tendulkar and Harbhajan Singh said about him. 14.36 IST: While Virat Kohli's wicket holds the key for both sides today, Jimmy Anderson doesn't think that the Indian skipper is invincible. ​14.30 IST: Hello and welcome to our Live Coverage of Day 4 of the first Test between India and England in Birmingham. Stay tuned as we bring you all the latest updates.